The article mentions her surviving son, John Robert Sutton of Grosse Pointe, her brother, George K. March and two grandchildren, John Robert Sutton, III and Paula Sutton, but nowhere does it state her given name, Gertrude Louise. CAn you imagine spending more than one minute in this outfit!?!?!? Also not mentioned was Gertrude’s part ownership in the local Republican newspaper, The Hillsdale Leader, and her position as Manager/Editor upon her father’s death in 1907. In the early 1900s, it was apparent a creative hand was at work in the publication of that local paper. Pictures of local citizens – including women – began appearing, with witty stories describing their activities. A series of biographical articles – with accompanying pictures – remains a valuable contribution to this day. Gertrude won journalism and newspaper awards and was honored by the Michigan Press Association in 1902, also acting as Secretary of that organization. Her speech given at that function (the first by a woman), was recently discovered in an online June 13, 1902 newspaper copy of The Seattle Daily Times. Its pro-Women’s rights stance must have been deemed radical for the times, a full eighteen years before women were given the right to vote in the United States! Quietly generous in her own way, “Mrs. J.R. Sutton” received accolades throughout her years as a donor to Hillsdale College. She attended the College “for several terms” prior to marrying J. Robert Sutton. In 1905, she received thanks through the Hillsdale Collegian for furnishing the “guest room” in East Hall, making it “complete in every detail.” Years later, she was also listed as a donor to the Hillsdale College Library Fund. Here is the house in readiness for you; empty as far as any eye can see,/But I must warn you that there lingers here, some ineradicable part of me./So if you hear a small sound at dusk, a rustle as of someone on the stair,/Please do not stir. It will be likely I, hoping to find a mislaid dream somewhere. Sadly, the property was then sold to the Michigan Bell Telephone company, who tore it down the following year and built a new brick office. 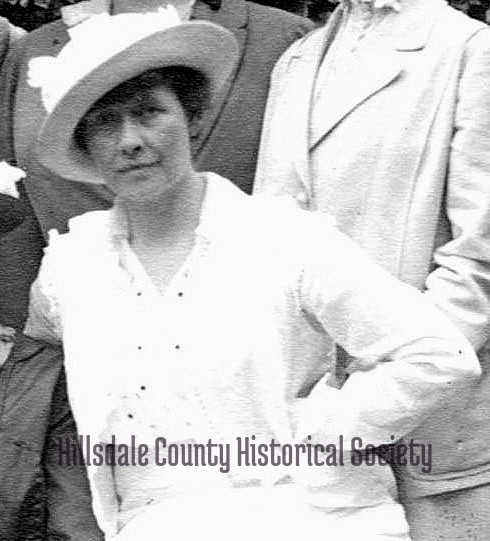 Gertrude’s legacy was honored at her burial site at Oak Grove Cemetery in Hillsdale on the afternoon of June 11, 2016, by family and members of local and state DAR (Daughters of the American Revolution), of which she was an active member. A reception followed at the Mitchell Research Center (the former Mitchell Public Library) in Hillsdale, fittingly right across the street from the location of her former home. May you rest in peace, Gertrude.